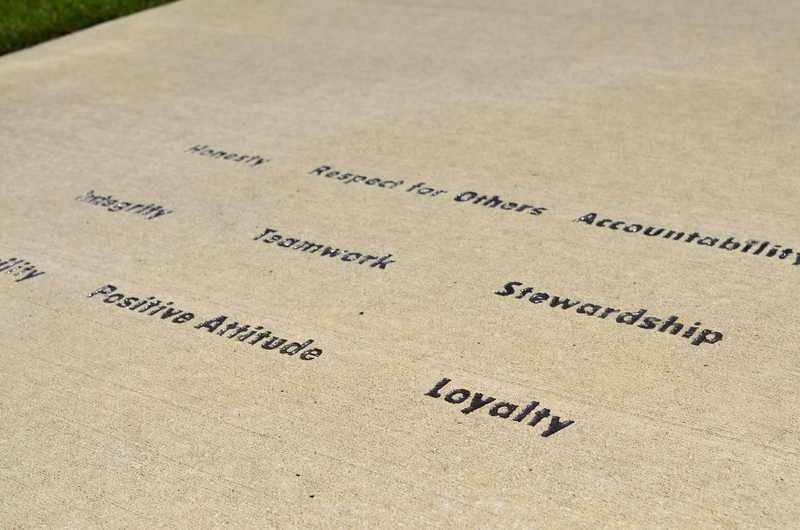 MidwayUSA Employees engrave Company’s Values on sidewalks throughout 21-acre campus in Columbia, Missouri. 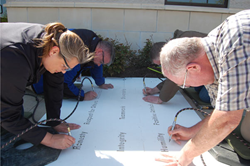 Thursday, July 9th will find MidwayUSA Employees finishing up Operation Concrete Values, a project where the Company’s Values were engraved on sidewalks throughout the 21-acre campus in Columbia, Missouri. 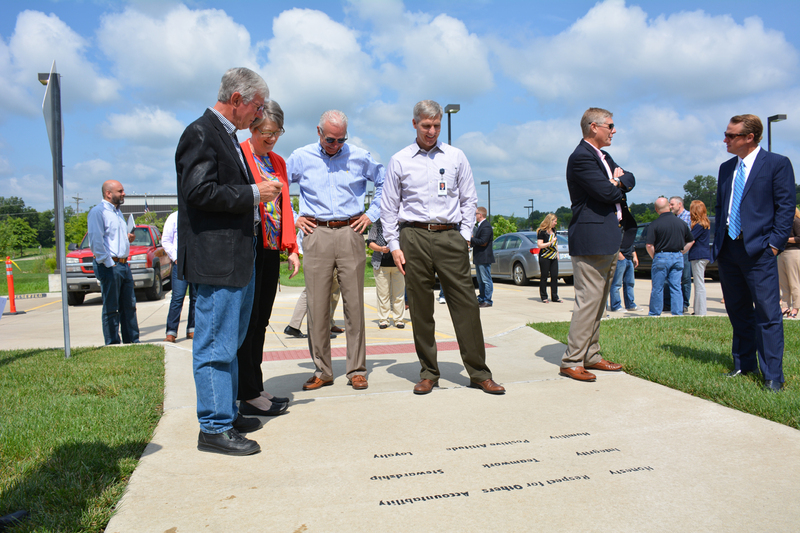 Larry Potterfield, Founder and CEO of MidwayUSA, recently invited Employees to participate in the engraving project spanning across the entire four-building campus, covering 17 entrances for a total of 20 sets of Company Values. 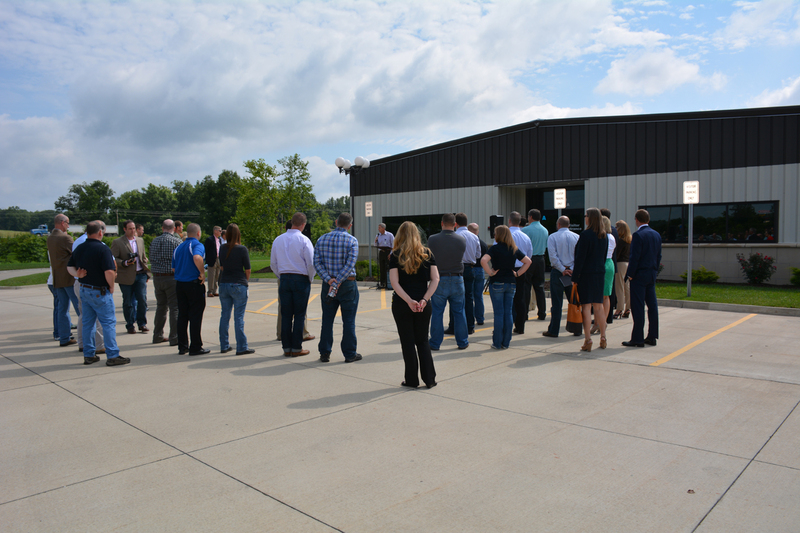 The nine Company Values, found on the MidwayUSA Mission Statement, are Honesty, Integrity, Humility, Respect for Others, Teamwork, Positive Attitude, Accountability, Stewardship and Loyalty. These non-negotiable family principles help guide MidwayUSA and its Employees in their decision making and interactions with one another. Larry’s leadership and inspiration for the project is undoubtedly a result of his Baldrige journey. MidwayUSA earned the prestigious Malcolm Baldrige National Quality Award in 2009, an award MidwayUSA and its Employees have applied for again in 2015. The Baldrige journey helped MidwayUSA identify and confirm the nine Values that over 350 Employees call their own. The event is open to the public and will be kicked off by the Potterfield Family at 10:30 a.m. on the West side of the Roosevelt building in front of door A at 6001 W Van Horn Tavern Rd, Columbia MO. Both country kids from Missouri, Larry and Brenda Potterfield turned their passion for shooting sports into a career by opening a small gun shop in 1977 that would eventually become MidwayUSA (http://www.midwayusa.com). They instilled family values like honesty, integrity and respect for others into the business, and strive to maintain this culture with each Employee added to their growing team. For over 38 years, MidwayUSA has offered JUST ABOUT EVERYTHING® for Shooting, Reloading, Gunsmithing and Hunting with an unyielding focus on Customer Satisfaction.